C ommunication is the very heart of marketing, and for years companies have fashioned communication strategies based on print, radio, and TV media to broadcast their message, but times are changing. In the age of the Internet, Benetton uses Quicktime VR to establish the atmosphere of its retail outlets, ABN Amro has a banner advertisement directly behind the goal at an Internet soccer game; Sony provides downloadable audio clips of its latest CDs; and Voice of America makes available, via FTP, software for predicting high-frequency broadcast propagation. These companies recognize that the Internet is an all-purpose communication medium for interacting with a wide variety of stakeholders. They know they must manage their brands and corporate image in cyberspace. They also know that the Internet is not just the Web, but a range of technologies that, in combination, can be a potent marketing strategy. As organizations stampede to the Internet, they need a systematic way to examine opportunities and relate them to available Internet tools. In particular, they need a cohesive marketing strategy for exploiting Internet technologies. Integrated Internet Marketing (I2M) is a structured approach to combining marketing strategy with Internet technology. I2M promotes creation of a strategy that synergistically exploits the range of Internet technologies (e.g., text, audio, video, and hyperlinking) to achieve marketing goals. This chapter, abundantly illustrated with instances of how companies are using the Internet to market wisely, presents the I2M model. A concluding case study demonstrates how one company, Benetton, is fashioning a coherent Internet-based strategy. To understand the potential of Internet marketing, knowledge of the different Internet tools is necessary. For convenience, some of these tools are grouped together and treated collectively because of common features (see See Internet technologies). Asynchronous text E-mail is generally used for one-to-one and one-to-few communications. A bulletin board (in the form of a newsgroup or listserv) can handle one-to-many and many-to-many communications. Cathay Pacific uses a one-to-many bulletin board to advise prospective customers of special airfares. Claris uses bulletin boards in the many-to-many mode to support the exchange of ideas among customers and support staff. Synchronous text Chat enables several people to participate in a real-time text-based discussion. A chat session is conducted on a channel, and those connected to the channel receive all messages broadcast. The American Booksellers Association uses chat to interview authors. File transfer File transfer protocol (FTP) permits the exchange of files across the Internet. Oracle uses FTP to distribute a 90-day trial version of Power Objects, a software product. Telnet Telnet enables an authorized user to connect to and run programs on another computer. The Library of Congress Information System (LOCIS) is accessible using Telnet. Audio Audio files are either downloaded and then played, or played as downloaded (so-called streaming audio). ABC uses Progressive Network’s RealAudio to deliver a news bulletin. Video Video files, like audio, are either downloaded and then played, or played as they are downloaded (so-called streaming video). PBS uses VDOnet Corp. technology to broadcast samples of its programs. Newswire An electronic newswire broadcasts stock prices, sports scores, news, weather, and other items. Companies are using Pointcast for reaching employees with internal news. Search engine A search engine supports finding information on the Web. Simple engines find Web pages. More advanced engines locate information based on defined attributes (e.g., cheapest model Y of brand X camera). Internet Air Fares allows visitors the ability to search for the cheapest airfares on a particular route that they wish to travel. Virtual reality The visitor can look around a location through a full 360 degrees, as well as zoom in and out. Honda use QuickTime VR to enable prospective customers to view its latest models, both inside and outside. The Web is the umbrella technology that can provide a single interface to each of the technologies previously described in See Internet technologies. The hypertext feature of the Web enables links to be created within a document or to another document anywhere on the Web. This supports rapid navigation of Web sites. The multimedia capability means that a Web page can display graphics, and videos and play sound and animations, as well as provide support for on-line forms and multiple windows. The Web is the means by which a company can use a variety of Internet tools to interact with customers and other influential stakeholders. It can shape and direct the dialogue between an organization and its stakeholders. To a large extent, an organization’s Web site defines the organization–establishing an enduring image in the minds of stakeholders. We maintain that organizations need a cohesive approach for using Internet technologies for communication. The interactive and multimedia capabilities of the Web, combined with other Internet facilities such as e-mail’s support for personal and mass communication, present a range of tools for interacting with customers. Furthermore, the Web can provide an interface to back-end applications (e.g., databases and expert systems technology). Consequently, the Internet offers an excellent basis for a variety of marketing tactics, which permits the development of a model for Integrated Internet Marketing ( I2M ). The concepts of integrated Internet communication apply to all forms of communication, not just that between seller and buyer. I2M (see Exhibit 2) is the coordination of Internet facilities to market products and services, shape stakeholders’ (customers, in particular) attitudes, and establish or maintain a corporate image. The central idea of I2M is that an organization should coordinate its use of the Internet to develop a coherent, synchronous marketing strategy. The Web offers a unique way to shape corporate image because it provides a means of communicating with so many stakeholder groups. For example, most organizations are interested in the ambiance or atmospherics that their establishment creates for the customer, where the term atmospherics refers to an organization’s retail environment. The Web provides an opportunity for customers to experience an organization’s atmospherics without actually being there (as the case later in this chapter demonstrates). In the same way, the Web provides new opportunities in terms of signs, word of mouth, personal experiences, and public relations. 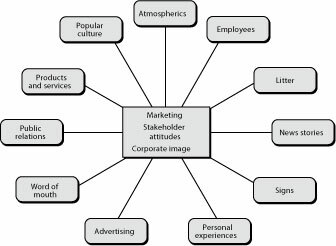 Traditional marketing theory and practice have discovered that it is very difficult to manage a corporate image so that the identical image is communicated to every stakeholder group. The Web provides a powerful tool to assist managers in communicating a unified image. The I2M matrix (see See The I2M matrix) can be used by firms to search systematically for opportunities for using the Internet to support marketing strategies. The concept is that each cell of the matrix is a focal point for brainstorming. An interactive version of the matrix can be used to stimulate thinking by showcasing how organizations are using a particular cell. Thus, clicking on the cell at the intersection of Atmospherics and Asynchronous text would jump to a page containing links to organizations using asynchronous text (e.g., a bulletin board) to establish atmosphere. Apple, an example for this cell, has established a bulletin board, EvangeList, to keep the faith of Macintosh aficionados. Postings to this bulletin board evoke an image of a feisty Braveheart valiantly fighting the Sassenachs (also known as Intel and Microsoft). Because we often learn by modeling the behavior of others, linking I2M cells to existing Web examples assists managers in identifying opportunities for their organization. Furthermore, by providing a variety of examples for each cell, creative behavior is aroused because each example can be a different stimulus. Traditionally, organizations have relied on news media and advertisements to transmit their stories to the customer. Naturally, the use of intermediaries can pose problems. For example, news stories, not reported as envisaged, can result in the customer receiving a distorted, unintended message. When dealing with the Pentium hullabaloo, Intel’s CEO Andy Grove used the Internet to communicate directly with customers by posting its press release to its Web page, as does Reebok. The hyperlink, a key feature of the Web, permits a reader to jump to another Web site by clicking on a link. An advertiser can place hyperlink signs or logos at relevant points on the Web so that interested readers may be enticed to link to the advertiser’s Web site. Hyperlinks are the billboards of the information highway. They are most valuable when they appear on Web pages read by many potential consumers, such as CNN or USA Today. As it is very easy to record the number of links from one page to another, it is relatively simple for advertisers to place a value on a particular hyperlink and for the owners of these pages to demand an appropriate rent. A Web site is the information age’s extension of society’s long history of developing attractive artificial environments. It parallels the Greek temple and Gothic cathedral of past centuries. These buildings were designed to evoke certain feelings within visitors (e.g., reverence). Similarly, a Web site should achieve a specific emotional effect on the visitor that prolongs browsing of a site. Alberto’s nightclub in Mountain View, California, stimulates interest by creating an aura of excitement and action. The visual on its home page exudes the ethos of the club. The Web provides an opportunity for customers to experience an organization’s atmospherics without actually being there. E-mail and bulletin boards have become effective methods of communicating with employees, particularly for highly dispersed international organizations. Because policy changes can be distributed inexpensively and instantly, the organization can gain a high degree of consistency in its communications with employees and other stakeholders. Instead of an in-house newsletter, an intranet can be used to keep employees informed of company developments. Previous issues of the newsletter can be made available, perhaps via a search engine, and there can be links to other related articles. For example, a story on new health benefits can have links to the firm’s benefits policy manual. Use of e-mail and the Web should lead to consistent internal communication, a necessary prerequisite of consistent external communication with customers, suppliers, shareholders, and other parties. A well-informed employee is likely to feel greater involvement with the organization and more able to perform effectively. The discarded Big Mac wrapper blowing across the highway does little for MacDonald’s corporate image. On the Internet, an advertisement arriving along with other e-mail may be perceived by some readers as highly offensive electronic pollution. Sending junk e-mail, also known as spamming, has aroused the ire of many Internet users, and America Online has taken action to block e-mail from certain firms and accounts. Just as offensive to some Web surfers are large or inappropriate graphics. These can be time polluters–wasting time and bandwidth as they load. Organizations need to ensure that their Internet communications are not offensive or time-wasting to visitors. The Web makes it easy for unhappy consumers to create a Web site disparaging a company or product. A disgruntled Ford owner has created a Web site for the Association of Flaming Ford Owners. Consequently, firms must monitor such sites and Internet traffic about them to head off PR disasters. Most organizations prominently display their logos and other identifying signs on their buildings, packaging, and other visual points of customer contact. There has been a clear transfer of this concept to the Web. A corporate logo frequently is visually reinforced by placing it on each Web page. Organizations can be extremely creative in their use of signs. Reykjavik Advertising, with a collection of pages for a variety of Icelandic clients, makes clever use of the puffin, Iceland’s national bird. Reykjavik Advertising’s so-called traffic puffin indicates movement relative to a page hierarchy–back, up, or forward, respectively . It is an interesting alternative to the bland arrows of a Web browser. The traffic puffin appears on each page. After viewing the pages, a clear impression of the resourceful use of the puffin remains. A new medium creates opportunities for reinventing signs. Animation is another way firms can reinvent their signs. Manheim Auctions, the Atlanta-headquartered car auction firm, uses animation to reinforce recognition of its corporate logo. The inner part of its circular logo rotates. Animation catches the eye and makes the visitor more aware of the Manheim logo. Customers often prefer to try products before buying, and some software providers take advantage of this preference. Qualcomm widely distributes a freeware version of Eudora Light, an e-mail package. Customers who adopt the freeware version can easily upgrade to a commercial version, which offers some appealing additional features. In Qualcomm’s case, the incentive for the customer to upgrade is increased functionality. Another approach is taken by game maker Storm Impact, which distributes TaskMaker as freeware. The full functionality of the game is available to play the first two tasks; however, the next eight tasks require payment of USD 25. On receipt of payment, a registration code to unlock the remaining tasks is e-mailed so that the next task can be tackled immediately. These examples support the notion of sampling–something which has previously been very difficult in the case of services and less tangible products. Gossip and idle chatter around the water fountain are now complemented by e-mail and bulletin boards. The impact of these electronic media can be agers realize even a ripple of discontent. Bad news travels extremely fast on the Internet. News is not always bad; Land’s End publishes customers’ testimonials about its products. When IBM announced its takeover bid for Lotus, it used the Internet to reach its stakeholders, media, and Lotus employees. Once the financial markets had been notified, IBM’s Web page featured the letter from IBM CEO Louis Gerstner to Jim Manzi, Lotus CEO. Also included were the internal memo to IBM employees, press release, audio clip of Gerstner explaining the offer, and a transcript of Gerstner’s 45-minute news conference. By the end of the day, 23,000 people had accessed the Web page–about double the normal traffic. In contrast, Lotus’s page had a four-paragraph statement from Manzi, and a company spokesperson said Lotus would respond when it had more to say about the offer. As IBM demonstrated, the Web can be an effective public relations tool. The advantage is that a company can immediately transmit its message to stakeholders without relying on intermediaries, such as newspapers and TV, to redistribute messages. Of course, mass mailing is also a method for directly reaching stakeholders, but a letter lacks the recency and multimedia features of the Web. There are now thousands of firms using the Internet to deliver products and services. Software companies are selling software directly from Web sites (e.g., Adobe sells fonts) and many companies deliver services via their Web site (e.g., UPS permits customers to track parcels). Computer firms struggle to solve hardware and software problems for a multitude of customers. This is a problem that can easily spiral out of control. One approach is to let customers solve each other’s problems. As sure as there is one customer with a problem, there is another who has solved it or who would love the opportunity to tackle a puzzler. If customers can be convinced to solve each other’s problems, then this creates the possibility of lowering the cost of customer service and raising customer satisfaction levels. Thus, the real task is to ensure that the customer with the problem finds the customer with the solution. Apple, like many hardware and software firms, has a simple system for improving customer service. It uses a listserv to network customers using similar products. As a result, the customers support each other, reducing the number of people that Apple has to support. Firms have discovered that popular culture (including movies, songs, and live performances) can be used to publicize their goods. As the Internet develops, clearly labeled products and ads are appearing in virtual network games. A popular MUD, Genocide, already features well-known fast-food stores. Goalkeeper, an Internet soccer simulator, lets visitors kick a soccer ball to try to beat the goalkeeper. The background of the game, a soccer stadium, includes typical sports arena advertising, including a banner for ABN AMRO, one of the world’s top 20 banks. As transactions are increasingly conducted electronically, a firm’s Web site will be its defining image and the main point of interaction with many stakeholders. Consequently, firms must ensure that they take full advantage of the technology available to maximize their impact. A systematic approach, using the I2M matrix and modeling the behavior of others, provides a framework for designing and implementing an effective Web site that takes full advantage of the Internet tools. Integrated use of this technology, however, is not enough. An enterprise, with a jumble of different page layouts and icons, communicates disorganization. The collective image of the Web site must communicate the overall integration and message of the organization. Not only must use of Internet tools be integrated, but also a corporation’s entire Web presence must be cohesive in order to communicate a consistent message to stakeholders. Subirana, B., and S. Palavecino. 1998. Amadeus: starting on the Internet and electronic commerce . Barcelona, Spain: IESE. ECCH 198-024-1. Schultz, D. E., S. I. Tannenbaum, and R. F. Lauterborn. 1994. The new marketing paradigm: integrated marketing communications . Lincolnwood, IL: NTC Business Books. Zinkhan, G. M., and R. T. Watson. 1996. Advertising trends: innovation and the process of creative destruction. Journal of Business Research 37 (3):163-171. Promotion: Integrated Web communications by George Zinkhan (University of Georgia, USA) is licensed under a Creative Commons Attribution 4.0 International License, except where otherwise noted.